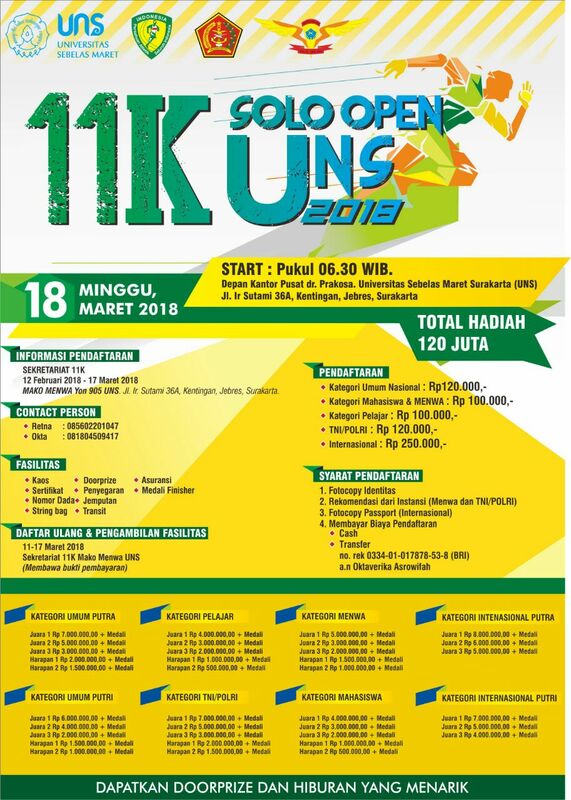 UNS – Korps Mahasiswa Siaga Batlyon 905 Jagal Abilawa (Menwa) Universitas Sebelas Maret (UNS) Surakarta will organize 11K Solo Open UNS 2018. 11K Solo Open UNS is 11km run in order to celebrate UNS 42nd anniversary. This event will be held on March, 18 2018. There will be 8 categories in this event, namely male, female, students, Menwa, TNI/POLRI, male (international), and female (international). The committee provides 120 million rupiahs for the winners. The registration has been opened from February 12, 2018 until March 17, 2018. The participants can register on https://uns.ac.id/id/pendaftaran-11k-solo-open-uns-2018/ by uploading the payment proof as well as the picture.